When Mr & Mrs Robertson purchased the plot for their energy efficient home home in East Lothian, it wasn’t in their mind to buy the house next door as well! However as it solved many difficulties the neighbouring property was duly acquired and the project got underway. Living next door to the site did at least mean that the build progress could be monitored on a daily basis, as well as overseeing the general security of the site. 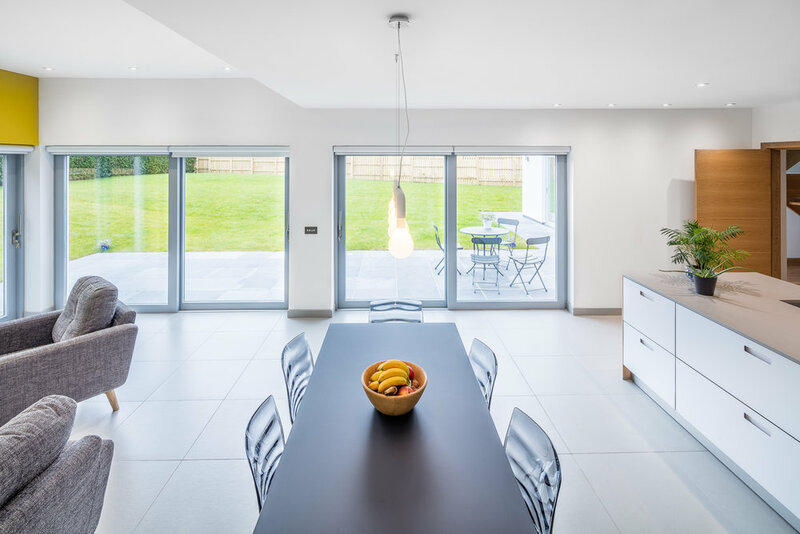 From initial sketches by Edinburgh based Camerons Architects grew the designs for a modern, super insulated, energy efficient home. Incognito Heat Co. was involved in the initial discussions with the architects to provide the heating and hot water solution. With involvement at such an early stage we were able to ensure that build methods favoured the installation of an air source heat pump. Underfloor heating was the favoured method of heating for this East Lothian energy efficient home, for both the client and the architect. 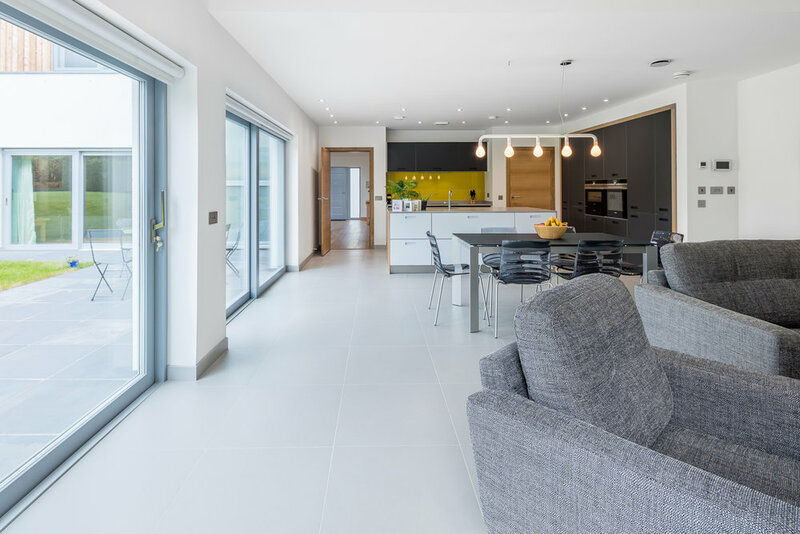 Conventionally underfloor heating is installed on ground floors; whilst wall mounted radiators are used upstairs only due to the perceived difficulties of UFH installation within a timber floor. We were keen to use underfloor heating on both floors as it can improve the efficiency of the heat pump. It was decided that the mid floor construction would be engineered for the weight of a screed allowing us to incorporate pipework easily and safely onto a timber deck. Manufactured joists were used throughout the mid floor construction. These are lightweight alternatives to traditional solid timber joists. They save weight and natural resources whilst giving great flexibility for other trades to pass services, ducts and cables through their open web structure. The upper and lower flanges must not be cut to preserve the structural integrity of the joist, which prevents the installation of underfloor heating within the profile of the floor- in the event this isn’t such an issue as the floor is normally sheeted immediately. This stiffens the entire structure by tying each joist to another, and provides a safe working platform for all other trades. There are compelling environmental reasons for using screed on upper floors, as well as improving the fire resistance and durability of the floor. A major component of the screed is an inert by-product of an industrial process, thus increasing the recycled content of the property. Using locally sourced aggregates and UK produced binders, (there is no cement used) there is low embodied energy in the product. By embedding the UFH pipes in a screed it is possible to operate the heating at a lower temperature. This is most significant for the operating efficiencies of the heat pump, as less energy has to be expended to maintain comfortable temperatures within this energy efficient East Lothian home. Since the introduction of the Energy-related Products Directive, every heat pump manufacturer must provide data on the energy performance of their equipment at various temperature outputs. It is now very easy to see the impact that build method, heat emitter selection and floor coverings can have on ongoing efficiencies and therefore running costs. Moving outside, the chosen air source heat pump was a 12kw unit from NIBE. This is an excellent example of Scandinavian engineering, NIBE are a company with a long proven track record in manufacturing quality renewable products. The installation was carried out under the NIBE VIP Installer scheme, the client benefitting from a seven year warranty. Inside the quality continues, with a 300 litre domestic hot water cylinder installed to provide plentiful hot water to the property's bathroom and three Ensuites. Early in the design process we discussed the clients’ requirements for hot water to ensure the demands of the household would be met at peak times. For properties where particularly heavy usage is envisaged we will provide larger volumes of hot water storage to suit, together with an indication of the additional energy that will be required to heat this. A third party MVHR system (Mechanical Ventilation Heat Recovery) was installed. This extracts warm, stale air from wet areas such as kitchens, bathrooms and Ensuites. The air passes through an MVHR unit to extract the energy, the stale air is vented outside whilst the captured energy is transferred to incoming fresh air and ducted to living areas. A big benefit of this is a reduction in energy lost via air changes, further increasing the efficiencies of the heating system. Additionally, a 4Kw solar panel system was installed to further the energy efficiency of this East Lothian Home. The build project was carried out by Lawrie Construction. 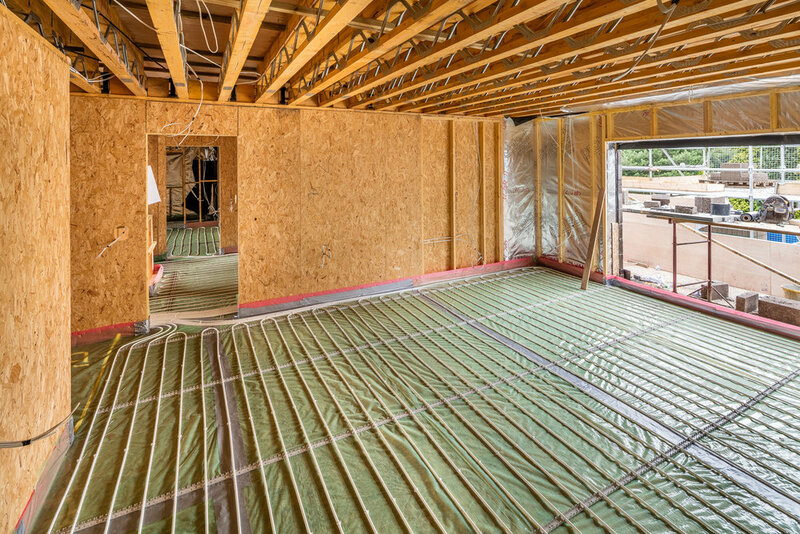 Incognito Heat Co. worked closely with Lawrie Construction to coordinate fitting the underfloor heating and screed, the air source heat pump and DHW cylinders were fitted in compliance with current MCS standards.